All appraisers on our staff subscribe to the Appraisal Institute of Canada's Standards of Professional Practice. All reports are prepared in conformity with the Canadian Uniform Standards of Professional Appraisal Practice. Cameron Dinning has been working in the real estate industry since 1999, starting with BC Assessment in Vancouver and transferring into private practice at Baker and Osland Appraisals in 2000. Cameron has a broad background in both commercial and residential real estate and provides appraisal services to a wide range of clients. Cameron holds a B.A. (Geography) from the University of Western Ontario and is an Accredited Appraiser (AACI) with the Appraisal Institute of Canada. Cameron can be contacted at or by telephone at 250-475-2221. 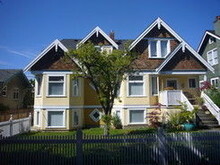 David has a broad based appraisal back ground with over 20 years of appraisal experience throughout southern BC. Expertise includes valuation, analysis and consultation of commercial, industrial, development, and acreage properties along with special use properties. David has considerable experience in the valuation and analysis of farm properties including vineyards and wineries. Along with valuation expertise David is an experienced expert witness. When not at work David enjoys the outdoors on southern Vancouver Island. David can be contacted at or by telephone at 250-475-2221. Jim Doersam has been involved in the real estate industry since 1988 and has been a residential real estate appraiser since 1993. Jim has provided residential valuation services for a wide range of purposes including finance, estate, resale, matrimonial, insurance, employee relocation, litigation, and income tax on properties throughout Greater Victoria, Saanich Peninsula, and the southern Gulf Islands. Property types appraised have included single-family residential, strata-title residential, residential estate acreages, equestrian properties, and agricultural properties. Jim holds a B.A (Economics) from the University of Victoria and is currently a recertified CRA member (Canadian Residential Appraiser) of the Appraisal Institute of Canada. Jim can be contacted at or by telephone at 250-475-2221. Jamie began his career as an appraiser in 1993, working for BC Assessment and later graduated in 1998 with a degree in Urban Land Economics. In 2005, he acquired his AACI certification and switched from the government sector to the private sector. Since then, he has done a wide range of appraisals ranging from remote fishing resorts to shopping centers to apartment buildings. Jamie can be contacted at or by telephone at 250-475-2221. Sophia is a Candidate with the Appraisal Institute of Canada and is currently completing her Post Graduate Certification in Valuation from UBC. She has a Bachelor of Arts degree with a Major in Economics and a Minor in Business from the University of Victoria, specializing in developmental economics. Sophia enjoys the advantages of living on Vancouver Island and the adventures available both through exploring the Gulf Islands and travelling abroad. Sophia can be contacted at or by telephone through 250-475-2221 (ext. 25). Bruno is a candidate member of the Appraisal Institute of Canada and is currently working towards attaining his Accredited Appraiser Canadian Institute (AACI) designation from UBC Sauder School of Business. Bruno holds an B.Sc. in Environmental Science from Royal Roads University. Bruno can be contacted by e-mail at or by telephone at (250) 475-2221. John is a candidate member with the Appraisal Institute of Canada, working towards the Accredited Appraiser Canadian Institute designation from UBC's Sauder School of Business. He has a Bachelor of Arts degree from UVIC with a major in Political Science and a minor in History. John is an avid cyclist and loves to spend time with his family. John can be contacted at or by telephone 250-475-2221. © 2014 Baker & Osland Appraisals Ltd.